a small fluid-filled sac or saclike cavity situated in places in tissues where friction would otherwise occur. adj., adj bur´sal. Bursae function to facilitate the gliding of muscles or tendons over bony or ligamentous surfaces. They are numerous and are found throughout the body; the most important are located at the shoulder, elbow, knee, and hip. Inflammation of a bursa is known as bursitis. bursa of Fabricius an epithelial outgrowth of the cloaca in chick embryos, which develops in a manner similar to that of the thymus in mammals, atrophying after 5 or 6 months and persisting as a fibrous remnant in sexually mature birds. It contains lymphoid follicles, and before involution is a site of formation of B-lymphocytes associated with humoral immunity. bursa muco´sa (mucous bursa) (synovial bursa) a closed synovial sac interposed between surfaces that glide upon each other; it may be subcutaneous, submuscular, subfascial, or subtendinous in location. subacromial bursa one between the acromion and the insertion of the supraspinatus muscle, extending between the deltoid and the greater tubercle of the humerus. See illustration. Subacromial bursa, lying between the acromion and supraspinatus tendon and extending between the deltoid and greater tubercle. From Dorland's, 2000. A closed sac or envelope lined with synovial membrane and containing synovial fluid, usually found or formed in areas subject to friction (for example, over an exposed or prominent body part or where a tendon passes over a bone). bursa of Achilles tendon one between the calcaneal tendon and the back of the calcaneus. anserine bursa one between the tendons of the sartorius, gracilis, and semitendinosus muscles, and the tibial collateral ligaments. Calori's bursa one between the trachea and the arch of the aorta. Fleischmann's bursa one beneath the tongue. His bursa the dilatation at the end of the archenteron. omental bursa the lesser sac of the peritoneum. pharyngeal bursa an inconstant blind sac located above the pharyngeal tonsil in the midline of the posterior wall of the nasopharynx; it represents persistence of an embryonic communication between the anterior tip of the notochord and the roof of the pharynx. popliteal bursa a prolongation of the synovial tendon sheath of the popliteus muscle outside the knee joint into the popliteal space. prepatellar bursa one of the bursae in front of the patella; it may be subcutaneous, subfascial, or subtendinous in location. subacromial bursa one between the acromion and the insertion of the supraspinatus muscle, extending between the deltoid and greater tubercle of the humerus. Subacromial bursa (bursa subacromialis), lying between the acromion and supraspinatus tendon and extending between the deltoid and greater tubercle. subdeltoid bursa one between the deltoid and the shoulder joint capsule, usually connected to the subacromial bursa. subtendinous iliac bursa one at the point of insertion of the iliopsoas muscle into the lesser trochanter. synovial bursa a closed synovial sac interposed between surfaces that glide upon each other; it may be subcutaneous, submuscular, subfascial, or subtendinous in nature. A sac or saclike bodily cavity, especially one containing a viscous lubricating fluid and located between a tendon and a bone or at points of friction between moving structures. 1 a fibrous sac between certain tendons and the bones beneath them. Lined with a synovial membrane that secretes synovial fluid, the bursa acts as a small cushion that allows the tendon to move over the bone as it contracts and relaxes. See also adventitious bursa,bursa of Achilles,olecranon bursa,prepatellar bursa. 2 a sac or closed cavity. See also omental bursa,pharyngeal bursa. bursal, adj. A closed tissue space within a joint, which is lined by a synovial membrane, contains hyaluronic acid and lubricin-rich synovial fluid, and which serves as a gliding surface to reduce friction within a joint. A closed sac or envelope lined with synovial membrane and containing synovial fluid, usually located or formed in areas subject to friction (e.g., over an exposed or prominent part or where a tendon passes over a bone). A small fibrous sac lined with a membrane which secretes a lubricating fluid (synovial membrane). Bursas are efficient protective and friction-reducing structures and occur around joints and in areas where tendons pass over bones. a fibrous sac lined with synovial membrane and containing a small quantity of synovial fluid. Bursae are found between tendon and bone, skin and bone, and muscle and muscle. Their function is to facilitate movement by reducing friction between these surfaces. bursae pl . pl. bursae,bursas [L.] a small fluid-filled sac or saclike cavity situated in places in tissues where friction would otherwise occur. Bursae function to facilitate the gliding of skin, muscles or tendons over bony or ligamentous surfaces. They are numerous and are found throughout the body; the most important are located at the shoulder, elbow, knee and hip. Inflammation of a bursa is known as bursitis. See also bursal. lies between the ligamentum nuchae and the dorsal arch of the atlas. Called also cranial nuchal subligamental bursa. under the ligamentum nuchae and over the axis. Called also the caudal nuchal subligamental bursa. intertuberal bursa. See bicipital bursa. large bursa on the summit of the calcaneus where the superficial digital flexor muscle tendon is partly inserted as it passes distally to the foot; in the horse there may be an additional small subcutaneous bursa over the tendon at this site; its inflammation causes 'capped hock'. embraces the female nematode during copulation; the structure is useful for the identification of some species of nematodes. an unidentified component of the lymphoid system, analogous to the bursa of Fabricius in birds, which is considered to be the primary site of the origin of B lymphocytes. an epithelial outgrowth of the cloaca in birds, which develops in a manner similar to that of the thymus, atrophying after 5 or 6 months and persisting as a fibrous remnant in sexually mature birds. It contains lymphoid follicles, and before involution is a site of formation of B lymphocytes associated with humoral or antibody immunity. May be very large in young chickens and compress the cloaca dorsally. It opens into the proctodeum, the most caudal of the three chambers of the cloaca. a small, serous membrane lined pouch ventral to the aorta and to the right of the esophagus and within the caudal mediastinum. a bursa beneath the superficial tendon of the infraspinatus muscle as it crosses the greater tubercle of the humerus. lies between the tendon of the biceps brachialis muscle and the brachial groove of the humerus. Called also bicipital bursa. a bursa over the intertubercular groove of the humerus and beneath the tendon of the biceps brachii muscle, in horses and cattle. a closed synovial sac interposed between surfaces that glide upon each other; it may be subcutaneous, submuscular, subfascial or subtendinous in location. lies between the navicular bone and the deep digital flexor muscle. Called also bursa podotrochlearis manus/pes. 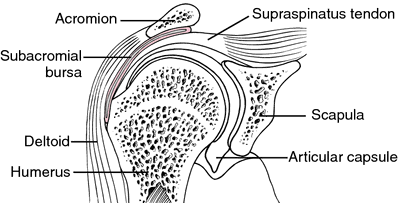 a bursa above the dorsal arch of the atlas and beneath the funicular part of the ligamentum nuchae. the potential cavity contained within the greater omentum. It communicates with the rest of the peritoneal cavity through the epiploic foramen (of Winslow). bursae which develop in subcutaneous sites over any bony prominence, e.g. coxal tuber, olecranon. between the funicular and lamellar parts of the ligamentum nuchae and over the spine of the second thoracic vertebra of horses. the space between the body of the epididymis and the testis created by the partly free body of the epididymis relative to its close attachment to the testis. beneath the tendon of the triceps brachii muscle as it passes over the summit of the olecranon. Called also tricipital bursa. over the greater trochanter between the tendon of the accessory gluteal muscle and the trochanteric cartilage.